This is a new Hill Stage Performance model as it was being built a few weeks ago. 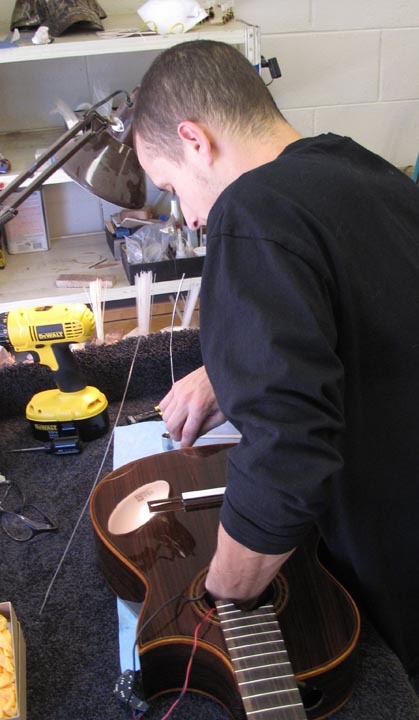 Its bound for the Healdsburg Guitar Festival next week. Like its 2 sisters made and sold at the NAMM show, this one is designed for the performing musician who wants and needs a thinner body profile, narrow neck, radiused fingerboard sound port and cutaway. Indian rosewood nomex double top with Western red cedar inside. The cutaway is Florentine style. The Stage guitar comes with a dTar multi-source pickup installed, as you can see Ben doing Thursday 8/4. Kenny will have this all Indian rosewood model and a double-top Brazilian model for people to try at the show, along with Signatures and Performance models.